Tyler Severance and CJ Atkinson show off some fun tricks in this new video. Looks like Tyler finally figured out Seasick, huh? Yoyo used is the Recess Charm. Tyler Severance and CJ Atkinson show off some fun tricks in this new video. Loads of good stuff in here, and it looks like Tyler finally figured out Seasick, huh? Old dog, new tricks, yadda yadda. Daiki Tanaka got his hands on the new bi-metal from Mowl and that means we get a beautifully shot new video filled with jaw-droppingly good yoyo tricks. WE ALL WIN. 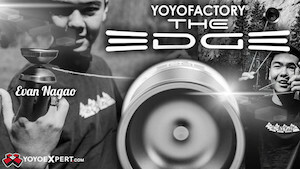 Yoyo used is the Mowl Surveillance. Daiki Tanaka got his hands on the new bi-metal from Mowl and that means we get a beautifully shot new video filled with jaw-droppingly good yoyo tricks. WE ALL WIN. After a two-year hiatus, Whimsy YoYos is back! The company that brought us the Poker Face, Aloha, Roar, and OMG are back with a new bi-metal release, the Aloha Encore, and it’s their strongest design yet. Incorporating design elements from the Aloha, the most popular of their original releases, and upgrading it with new weight distribution and stainless steel weight rings, the Aloha Encore aims to be a new competition yoyo from the reborn Whimsy YoYos. We got a chance to play with one of these pre-release models and it’s definitely a great upgrade from the original Aloha…lots more power but still feels great in the hand. A limited pre-release (plus some b-grades) will be available direct from the Whimsy website on April 28th, with a full retail release of the Aloha Encore following shortly after. Check out specs and more pics below!